Guava fruit contains two to three times as much vitamin C as freshly squeezed orange juice, and its tree provides nutrition in tropical areas where other citrus trees don't prosper. A member of the eucalyptus family, guava (Psidium guajava) is best grown in U.S. Department of Agriculture winter hardiness zones 9 and warmer. The precise origins or native range of the guava tree is cloudy since it has been cultivated for so long and spread around by birds and humans. It is believed to be native to southern Mexico and Central America, although it is widespread in Tropical America and the West Indies. Today, guava trees are found growing on the Pacific Islands and in Australia, southern and Southeast Asia, the Middle East, and northern Africa. 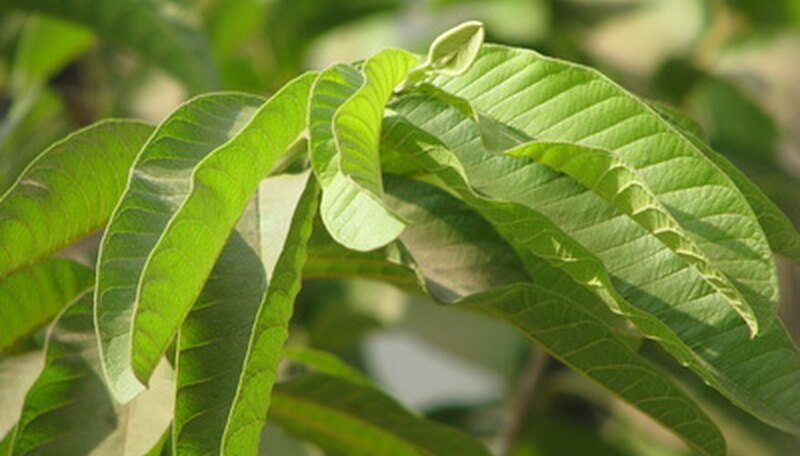 The guava tree's bark is thin and coppery brown, flaking away to reveal greenish skin. The spreading branches don elongated oval green leaves that are fragrant when crushed. During warm months, small white, lightly fragrant flowers are pollinated by honeybees. Three to five months later, they yield musky-scented fruits that are light yellow with a pink blush. The inner flesh, which ranges from acidic to sweet, is salmon pink and filled with lots of seeds. The leaves may partially drop away during extended droughts or when light winter frosts occur. A guava tree matures to a height of about 30 to 35 feet and a spread of 30 feet. It typically lives for 30 to 40 years, with a decline in fruit production after 15 years, according to Purdue University. In orchards, older trees are often drastically pruned back and allowed to rejuvenate with increased vigor and fruit production. Plant guava trees about 25 to 35 feet apart from each other in any fertile soil that is moist and well-draining, acidic or alkaline. At least eight hours of direct sunlight daily is best, as it promotes uniform growth and the best flowering and subsequent fruiting. Trees are drought tolerant and able to survive in rather infertile soils, but timely irrigation and use of organic mulches and fertilizer applications improve health and vigor. Prune suckering stems from the trunks and any surface root to prevent a thicket. Guava fruit is a prime host for a number of insect pests, notably the Mediterranean, Oriental, Mexican and Caribbean fruit flies, and the melon fly, according to Purdue University. Since the fruits bruise easy and do not have a long shelf life, they are picked when the skin is slightly firm to avoid damage. Fruit flies lay their eggs in the young fruit, and then the larvae damage the maturing flesh. 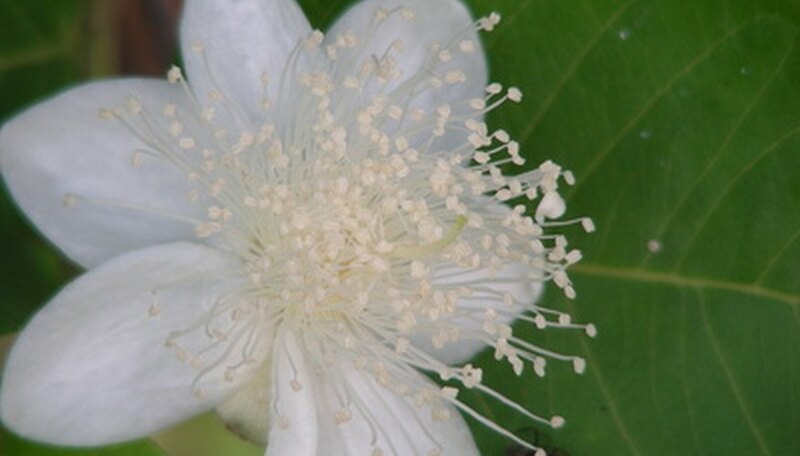 In some regions, guava trees are a prohibited species or are considered a noxious, invasive plant that germinates rapidly from the dropped seeds and out-competes native plants. Beside this species of guava tree, three others are of note and may be encountered in tropical gardens. The strawberry or cherry guava (Psidium cattleianum), Chinese guava (Psidium cattleianum var. lucidum) and Bahama stopper/wild guava (Psidium longipes) provide edible fruits or act as fast-growing shade or courtyard trees. Overall, there are about 100 species of trees and shrubs in the botanical genus Psidium.